Stormont is to loan £9.3m towards the cost of a plant in the Republic of Ireland to help deal with waste from Northern Ireland's poultry industry. 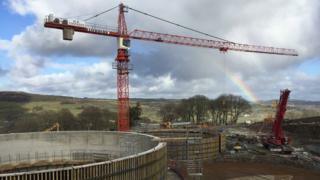 The anaerobic digester is being built near Ballybofey in County Donegal and will treat 25,000 tonnes every year. Biogas produced will be sent to Northern Ireland to help heat and power factories owned by manufacturing companies Bombardier and Montupet. The Northern Ireland Executive loan covers 40% of the £23m capital cost. The by-product from the process, called digestate, will be spread in forestry and on land near the plant. The agri-food industry said the absence of a long-term solution to the poultry waste problem threatened "the sector's viability". About 6,000 people work in the poultry meat sector in Northern Ireland and it is a major contributor to the economy. But finding a solution to the 270,000 tonnes of waste it produces a year has been a headache. Some of it is spread as fertiliser on fields, but it is high in phosphorous and Northern Ireland already has phosphorous-rich soils. That means there is a danger that additional land spreading could lead to excess phosphorous running off into rivers or lakes and causing damage. The European Union has rules against that, which Northern Ireland must comply with. That is why the treatment plant is being built in the Republic of Ireland. The soil where the digestate will be spread has lower levels of phosphorous and can cope with the additional nutrients. The plant at Ballybofey already has planning permission and is licensed by the Republic of Ireland's Environmental Protection Agency. Built by Williams Industrial Services, specialists from Mallusk in County Antrim, it is expected to be operational by March 2017. It is one of a number of anaerobic digesters expected to be built to take poultry litter. It is understood a second plant, if approved, could deal with more waste and would be built in Northern Ireland.